The initial attraction to Amazon's Alexa in hotels is unmistakable. Hoteliers love extending their brand to the new voice-medium, not to mention branding skins on the devices in memorable and distinct ways. The TripAdvisor Reviews are overwhelmingly positive. Guest engagement levels with the technology are already multiple times those of high-friction hotel apps and in-room tablets. 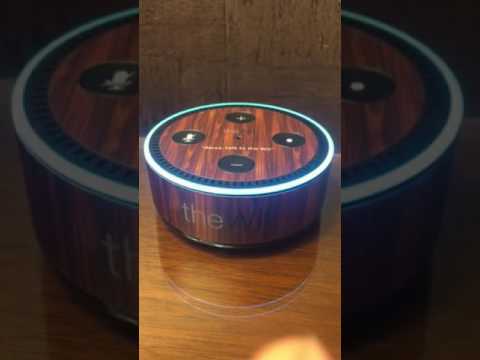 As we approach one year since we first deployed the Amazon Echo in a hotel - at the JW Marriott San Antonio - Volara's solution is already processing as many item and service requests per occupied room as the in-room telephone and twice as many as by SMS. In fact, the Volara-powered devices are processing four times as many requests for information (e.g., concierge recommendations, hours and locations of hotel amenities, etc.) as the more traditional guest communications tools. This is striking, particularly if you consider that most guests have never seen, let alone interacted with, the technology before entering their guest room. While leveraging (and augmenting) the natural language processing provided by the leading platforms, Volara is enabling measurable business outcomes for its hotel clients. Below are 13 ways hotels are leveraging Volara's software and the new voice-medium to (I) improve guest experience, (II) influence guest behavior, (III) drive more efficient service, and (IV) help hoteliers understand their guests better. As a frequent traveler and loyal guest at certain hotel brands, I'm often met by the general manager when I arrive at a hotel. That pleasant and personal interaction provides an additional level of comfort that furthers my commitment to the brand. But what about all those other guests who the General Manager just doesn't have time to shake hands with? Is there not an opportunity to turn them into guests for life? Volara's software enables the personal greeting from the General Manager to scale; bringing his or her voice into the guest room and generating a warm feeling toward the property in many more guests. 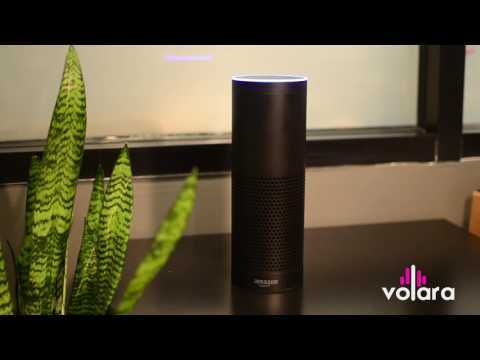 As Volara enables greetings to be recorded in seconds in any voice and updated in real-time, some hotel's have taken the liberty to innovate further and share personal greetings from celebrities like the one in the video below. His voice is so recognizable that he needn't even introduce himself! "Frictionless" has become a buzz word in the hospitality industry, but reducing barriers to engagement has long been a cornerstone objective for technologists. The new voice computing platforms remove two of the biggest barriers, proximity and dexterity, from the engagement process while ensuring access is immediate - i.e., no waiting on hold. While there is still some learning curve to voice, it is de minimis when compared to screen-based computing. And the immediacy of response puts in the dust the archaic experience of listening to a phone ring and waiting on hold for an operator. Sure engaging with a computing platform by voice is fun, but engaging with leading edge entertainment platforms is even more fun. Guests have always had the opportunity to access and play their own music on the hotel provided Amazon Echo and Dot hardware. And now hotels have an opportunity to provide their own branded music playlists leaving guests dancing and grooving to tunes curated specifically for their guests. Look out for an announcement about Volara's partnership with a leading commercial music provider very soon! Volara's integration with BeyondTV enables voice-based control of the in-room television. Ask for Star Wars and you'll see Darth Vader. Ask for CNN and there's Wolf Blitzer. Ask for a sports channel and you'll be defaulted to ESPN. No more fumbling with dirty hotel remote controls! No more squinting to read the tiny print on those TV guide cards! Volara's custom hotel games are also a pleasant surprise for hotel guests. Scavenger hunts and trivia games that will delight the kid in all of us are surprising, remarkable, and simply a lot of fun. Who doesn't love finding the hidden treasure?!?! Unfortunately, hotel rooms are sometimes noisy. Whether its because the room overlooks the street, there is a wedding in the building, a crying baby is next door or a partner is snoring, there is often noise streaming into our ears while we're trying to get a good night's rest. Volara can now drown out that noise with chirping birds, crashing waves, or gusting wind to help your guests sleep more soundly (pun intended). As hotel guests have turned more and more to their personal connected devices for information, recommendations, and even services, hotels have been left with fewer opportunities to engage their guests and have lost that valuable position as the guest's guide and experience curator. Volara is re-establishing the hotel in the sphere of influence of the guest. Those hotels that are fortunate enough to have a top flight concierge on staff are lucky, but long waits for access to these insiders in the know during peak times can leave guests frustrated and turning to Yelp. Guests looking for personal concierge curated recommendations without delay are now in luck! We love what our hotels are doing to bring the voice of the concierge into the guest room. Below is a video of our solution at TheWit by Hilton Doubletree, which is bringing the insights and enthusiasm of perhaps the most impressive concierge in the country right into the guest room. Real-time on-property updating the content being shared with guests means that the hotel can easily and seamlessly develop and tweak special offers to drive business outcomes. Want to fill more seats at your buffet? Promote it in real time at the end of every guest question about food. Empty spa appointments or tee times? A few clicks of the mouse and you can be offering your hotel guests discounts or incentives that will encourage them to fill those slots. Best of all these offers can be included in contextually relevant interactions, so they sound more like helpful suggestions than marketing, and the results of your effort can be measured and reported. Voice, by its very nature, is interactive. Nobody wants to be spoken to, or worse, screamed at with marketing messages. But Volara's voice-based marketing funnels allow guests to discover what they're looking for on their own at times that make sense for them to be purchasing an item or service. These funnels improve conversions and, given their frictionless nature, open up revenue streams that may have been thought to be lost to apps. This video shows one of the most obvious and simplest voice-based marketing funnels we employ at our hotel properties. As hotel rates have been squeezed by price-competitive third party booking systems and other market forces, hoteliers are hyper-focused on providing top rate hospitality at a lower cost. Seamless technology integrations eliminate human error and enable more rapid guest service with less human resource required. Our light integrations with Zingle, Kipsu, TrustYou Messaging, GoMoment, and Whistle enable guest communications to move seamlessly from the voice-medium to the display on the guest's personal device. Our deep integrations with Amadeus HotSoS, SynergyMMS, and Salesforce are routing the guest's voice request directly to the appropriate member of staff for fulfillment. 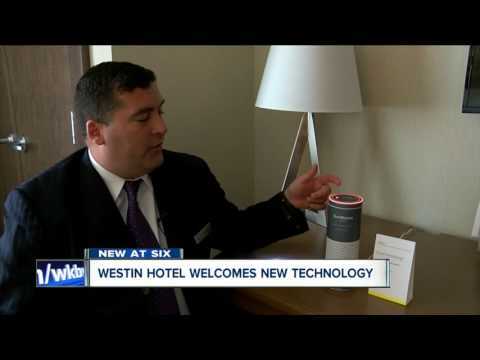 Check out this TV news report about the Westin Buffalo that highlights the speed of response to a guest request over the Amazon Echo running Volara's software! This is thanks to Volara's deep integration with Amadeus HotSoS. Volara is not just guest facing, it also provides an interaction set that can make hotel staff more efficient. Eliminate those clipboards and streamline communication across your staff. Room clean? Just tell Alexa. Maintenance required? Just tell Alexa. This fully integrated solution is making it easier for hotel staff to do their work, keeping more rooms in service and expediting turnover times between guests. There is nothing quite as satisfying as realizing you don't need to get out of bed to shut the lights off, adjust the temperature, or light the Do Not Disturb button outside your hotel room door. The instant control of your environment with speech will make you wonder how we tolerated the wall switch for so many years. Volara-powered devices can integrate with any wifi-enabled device in the guest room... the possibilities are just now being discovered and will grow as more smart appliances are launched. Volara does not have access to transcripts or recordings of guest requests, but the real-time interaction logs, aggregated reporting, and industry benchmarks provide actionable insight that is already driving important decisions about guest service. Never before has data been available that quantifies what guests say, when they say it, or how voice-interactions have driven their behavior. Are guests asking about an amenity you don't provide? Maybe you should offer it. Are guests asking for service at certain hours? Maybe you should staff accordingly. Are you having trouble getting feedback from guests? Maybe you should engage them by voice and reduce the time and hassle required to respond to a survey. The new data has the potential to change the way you think about your guests and the hospitality they desire. Obviously voice isn't the only way your guests will choose to interact with your property. They'll be contacting you by SMS, Facebook Messenger, email and countless other platforms - each of which will provide an additional piece in the overall data puzzle that you'll want to analyze. Volara's reporting can be easily exported into common file formats for your analysis. The data will tell an insightful quantitative story, but qualitative feedback from guests is still best delivered through staff engagement. Volara is promoting three way conversations between staff, guest and the technology. We aren't replacing your high value staff, we're enhancing their impact on the guest experience by driving more guests to engage with them around their specific expertise. Is your chef introducing the evening's specials personally to your guests? Is your bellman telling every guest about the amenities in their room? Is your concierge who knows every great restaurant in the city being leveraged by guests for his or her specific expertise? Volara can enable these types of interactions at scale and thereby facilitate meaningful human interactions between your guests and staff. We've seen the magic of human connection spurred by voice-based technologies in hotels happen and it's truly remarkable. Technology without a purpose is a toy. While engaging with voice can be a lot of fun for hotel guests, it can also help hoteliers achieve important and measurable business objectives. 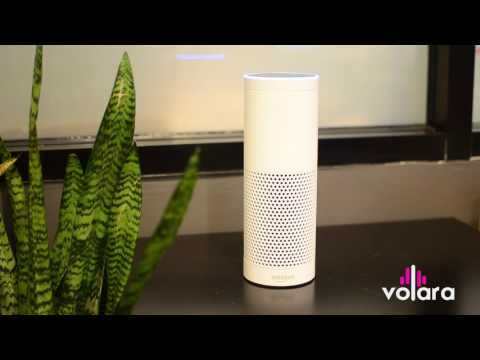 Far from a toy, Volara-powered voice-based solutions are a powerful business tool that, when used properly, can drive a demonstrable financial return for hotels. Click here to learn more about Volara, schedule a demo with our CEO, or watch the video below.